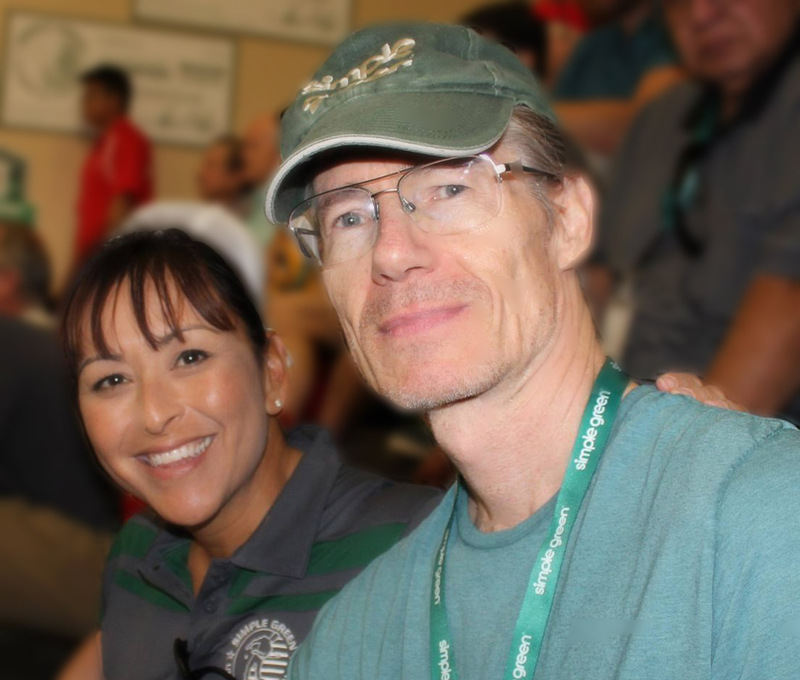 Pros from the 1990’s handball circuit may recognize my name from the early 1990’s, around the time David Chapman first made his mark as a phenomenon, when I became a part of his traveling entourage, simply as a result of some coincidences. After the Long Beach Athletic Club closed down, where David was a member, their handball club joined LA Fitness at the Traffic Circle, where I had also joined, after my primary club in Rossmoor started losing players. I needed to find a new home and new competition. Thus, as a result of simple proximity to David, I eventually acquired enough time and history around the 9-time national champion that I can discuss some of his legacy with some authority today. We occasionally enjoyed other side-trips, as well, like to miniature golf with David Fink, when he traveled to our town, or to visit Ed O’Neill’s show “Married with Children,” since Ed was one of David’s most famous fans back then. “David,” Ed once said to him, while David, Sol (a Circle racquetball player), and I sat in Ed’s dressing room, “you are your own secret weapon.” I loved that line. David was his own first secret weapon. Ed’s comment led me at the time to compare David to Wolfgang Amadeus Mozart, a classical music prodigy by 4 years old, a comment I made aloud and in a publication on handball. Later, I mentioned my Mozart analogy to David’s friend, Ben Thum, who liked it enough to use it in a broadcast. Once, at our club, I was fortunate enough to be sitting around, when, as seldom happened in our presence, David’s dad Fred and David talked tournaments and tactics and strategies. Fred was David’s second secret weapon. Fred conferred upon David an indomitable desire never to lose. He also had David competing so early in David’s life that David never learned to experience nerves in tournaments. Fred had military experience and knew that two conditions, Flight or Fight were innate responses, and so he deliberately taught David to habituate the fight-mentality, to the exclusion of the flight mentality. I was also especially fortunate enough to meet and befriend David’s third secret weapon: Coach Lew Morales, AKA the Pineapple Man. Lew earned this nickname when his longtime handball acquaintances discovered that he descended from Philippine pineapple workers who had migrated to Hawaii, and then to the mainland. No two ways about it: Lew was a handball genius in blue-collar clothing. Whereas Fred Chapman had taught little David fearless tournament grit from the time David was 5 and up, Lew taught pre-adolescent David game-tactics and psychological black-belt mastery over opponents twice his size and three times his weight. Fortunately for us, many of David’s youthful handball triumphs and matches are preserved in video, though a few remain outstanding or missing and deserve mention. Around that time Fred moved to Montana, but Lew, David, and I remained to brainstorm our sport. Among the most outstanding observations ever made about David in those 1992-1993 days, by players at our club, and by opponents, David never really needed to travel to develop his supreme skills. I was present when David had asked Lew those two relevant questions. “Lew, how can I beat the more powerful players?” “I’ll teach you how to do that.” Lew said. David then asked, “But don’t I need to travel to get more experience against better players?” “No,” Lew answered, “you can learn all the skills and master them right here, playing against lower players.” So, after watching David evolve at our club, playing all us dullards, you could say this was the first lesson about handball I learned from him: you don’t really need to travel to improve your game, if you have a daily mission. You can actually learn crucial motor skills faster by competing against lower players. The reason for this is like practicing scales on the piano. You start slow, until you groove in the mechanics; and then you can easily speed up as you master the processes. You need a daily mission whenever you play lower—or even equal—players at your home club. David worked on just such daily drills when playing us at the “Circle.” For examples, for a whole game, he hit only passes until he earned a point or sideout. He would find just the right height to beat each of us, depending on our unique foot speed or balance. Which implied that he observed us and learned our foot-speeds. Or some days he hit only fist balls to the ceilings on every serve or on every pass-retrieve. Here’s how it works. The drill starts with your serve or your return of serve. You must completely move the opponent to the back court with the serve or return-of-serve, so that you buy time to move yourself to the “red-carpet area,” between the restraining line and the short line, and then, watching the opponent the whole time, place a front foot down, somewhere in that area between the restraining line and the short line—just at the very split second the opponent makes hand-contact with the ball on his next shot. Your job from there is to predict his shot and interrupt it, by moving instantly from this spot between the restraining line and the short line toward the trajectory of the opponent’s shot. This drill teaches you what to hit to control the opponent from the center of the court. It takes away any possible superior foot speed and strength of the opponent. David used this skill on the fastest player any of us had ever seen at that time: Rod Prince. Arguably, David built his championship style and record on this first drill. Lew’s definitions were counterintuitive, but right-on, and beyond my ability to apply at the time. Not so for David. When I looked perplexed, David explained, “Boak, a true kill-ball bounces twice or more before the front line.” I had never heard it defined that way, since as a poorly trained player, I found any low ball moving away from me pretty much an effective kill shot. As he mentioned in his most recent anticipation article at the WPH site, he kept anticipation simple, because he knew exactly what he was doing. Later, “That’s how you really define focus,” Coach Lew told me, out of David’s earshot. Lew loved to change associations that way. . . .
What Lew was getting at, however, was HUGE. Players lose focus as they go to sleep at times during rallies, sometimes because they are focusing on mechanics, rather than on tactics, and sometimes because they have hit a shot, and are spectating, rather than recovering center to predict and dominate the opponent’s next shot. Lew and David both knew that you can’t sleep during rallies if you are busy with responsibilities, such as placing the opponent deep in the court so that you can move to the red-carpet area and watch the opponent hit. As a university teacher, I enjoyed great work hours in those days, getting “out of school” at 2:30 PM. Naturally, as a handball addict, I headed straight for the club to practice. Luckily for me, David usually arrived fifteen minutes later, having gotten out of school himself, and the two of us found ourselves with an hour or so before the usual cadre of guys showed up around 3:30 or 4 PM: Mike Bock, Kelly Russell, Bruce Hanief, Alan Swickard, Bill Osborn, Don Anderson, Nat Bethers, Lew, Steve Herman, Phil, Larry Leveque, maybe John Ramsey, Pete Xenos, Dave Ramsey, and so on. David couldn’t wait for them so he proposed many different games and alternatives for the two of us to play, until guys showed up for doubles. One of his favorites was “Two-Bounce.” We would compete to eleven, whereby the first player to eleven “WON.” You could only make contact with the ball just before the ball bounced a second time—inches from the floor. If you hit the ball earlier, or later, or contacted it too high, say knee high, as judged by the opponent, then the opponent got a point. Otherwise, you scored as normal. So, at times in a rally, both players could score, and sometimes a player could earn two points, one for winning the rally, and one for the opponent violating the rule. Another game was “Three-Bounce” and introduced David’s fourth lesson. This time, you could let the ball bounce twice, but you had to hit it before it bounced a third time. His answer seemed disingenuous to me, as if he knew something he wasn’t telling. How can you learn to go down with the ball, if the original rules require you to hit it before it even bounces twice, let alone three times? For my response, all I could do was clean my sports-glasses, so as to better benefit from my lens-prescription. . . .
One day we arrived early, and David said, “We’re going to practice backwalls today, because I have a tournament coming up.” Laconic as always, David walked on the court and threw balls to the front wall to give himself backwall setups which he practiced killing, passing, or hopping. I joined him on-court, but I felt self-conscious and pretty much squandered the session. After about ten minutes, David asked me, “How come my backwall kills are harder and lower than yours? You’re a big man. You should hit the ball twice as hard as I do.” He was 17, so I was getting toward 40. I never took David’s comments for bragging, because he knew what he could do and what he couldn’t do. I also never took these comments as insulting, because he always challenged you to become a better player. He had nothing to fear challenging us, or implicitly revealing some black-belt handball technique, because he knew no one could beat him, NO things being equal. “What am I doing wrong?” I asked him. “Watch me,” he said. He threw five balls to the front wall, and then, after they caromed off the back wall, he executed five powerful low unreturnable kill shots—each one bouncing twice before the front line. “Now do what I did.” I noticed how low his hand was to the floor when he contacted the ball. I really did not understand how he could do that. And when he struck the ball from there, the ball stayed an inch and a half high all the way to the front. As I tried to imitate his motion, he just smiled. I kept pulling the ball up, without knowing why. I only realized just a few years ago where my failure was. On his nonpareil backwall shots, David delayed making contact with the ball until he had transferred his forward momentum and core weight completely onto his front leg, while striking with his strong arm partly underarm and partly sidearm. He always used an active front arm and shoulder to lead the shot and add momentum and power and shoulder-rotation to the strike. I had been trying to contact the ball somewhere in between, while my weight transferred between my back leg and my front leg. While David trusted Lew and his dad Fred, David wanted insurance, (while I had nothing to offer him, for though I was an experienced tournament player, I was not an experienced winner, and I had huge flaws in my game and tactics). Therefore, under advisement, David arranged to visit Fred Lewis at Lewis’ handball camp, for a special one-on-one session dedicated to the sole concept of beating John Bike. Fred Lewis watched David play, and wrote up a two-sided report on yellow, lined paper: detailing what David needed to do to beat the larger, stronger, faster man. When David returned from the camp, he showed me the notes, and eventually gave them to me. “I know what they say,” he added. Basically, the notes dictated to David to use multiple pass shots to “help Bike” wear himself down. In theory, if David was patient, prepared to control center court, and willing to see Bike score for a while, soon Bike would begin to miss. John used to believe, as he frequently exclaimed, “When you’re hot, shoot! And when you’re not hot, shoot until you get hot!” This philosophy required lots of gas, steam, and energy, as Lew and Fred observed. No one can squat and shoot and convert or execute true kills or even kill-passes over a duration of 3 hours. Fred Lewis predicted that, for David, mastering the different height passes would ultimately yield David the 1993 Title as well as future titles. 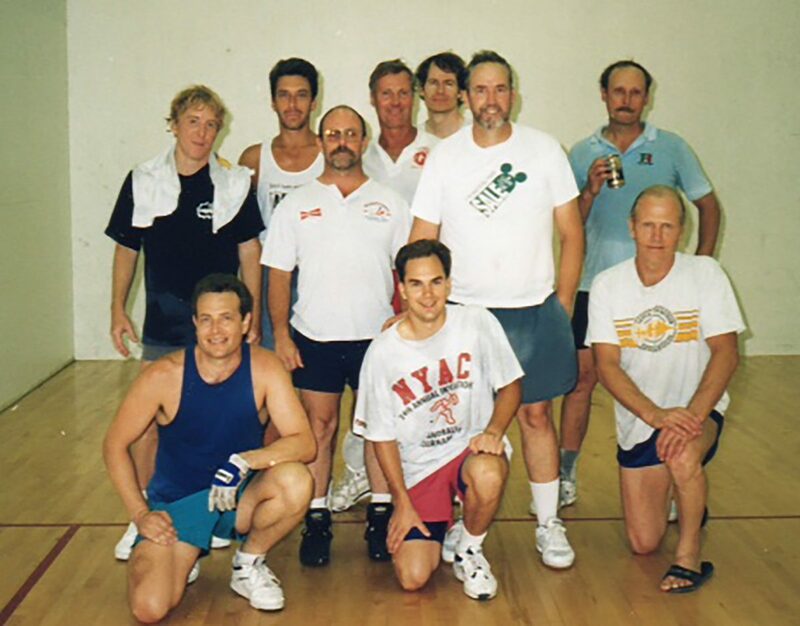 David had his first chance to practice against Bike at the Royal Athletic Club in Burlingame, CA, for the Pro Handball Showdown in May of 1993, a month prior to David’s next birthday, and prior to the USHA Nationals. Much publicized, and available as a pared-down video on YouTube, handball players the world over can revisit the match repeatedly to watch David leverage Fred Lewis’ elite game plan, to ultimately wear John down and defeat him, pulling away. John Bike was understandably disappointed with this result, and showed up to the 1993 Baltimore venue for the USHA Nationals, prepared to crush everything David could do. After a slow start in the semifinals, where they met, David found the right heights of his serves and shots, to wear John down with passes and win in two. David’s finals-contest against Randy Morones that year was an anticlimactic afterthought, with all due recognition owed to Randy’s genius with a handball. The true match of the tournament was David’s win against Bike. A family video of this match exists somewhere, as I watched it with David a few times, but where it is now remains a mystery. If I recall, the video doesn’t start until 6 serves10 game one, when David pulls it together and closes the game, and then starts again at about 6-5, game two. Bike does threaten in game 2, until David hits two soft reverse serves to the right. David slammed with Naty Jr. that year, 1993, the year David emerged, the youngest player to ever win the USHA Nationals. Other occult lessons weave through David’s experiences above, each deserving enumeration and definition. ►Neuroscience and brain-mapping now reveal that such a thing as pure talent may not exist (if analysts remove disabilities from discussion): “talent” may simply be a popular term for “very early childhood-events experienced in a complex environment.” David’s early handball experiences shaped his neural-mapping such that he could visualize a unique-to-handball 4-D map of the handball court. By the age of 6, he could pre-visualize the shapes of his shots, the movements and shot-choices of his opponents, the convergences of time of all of these events and objects, along with his ever-changing positioning in that space relative to the movements of his opponents and the ball. Children with such early experiences in any domain may be perceived as “geniuses,” or talented, to external observers—but the effect really results from youthful brain-plasticity. Luckily for those with good diets and self-management, we now know that profound brain-plasticity continues to late in life, as recent research reveals, so we can still learn from David. 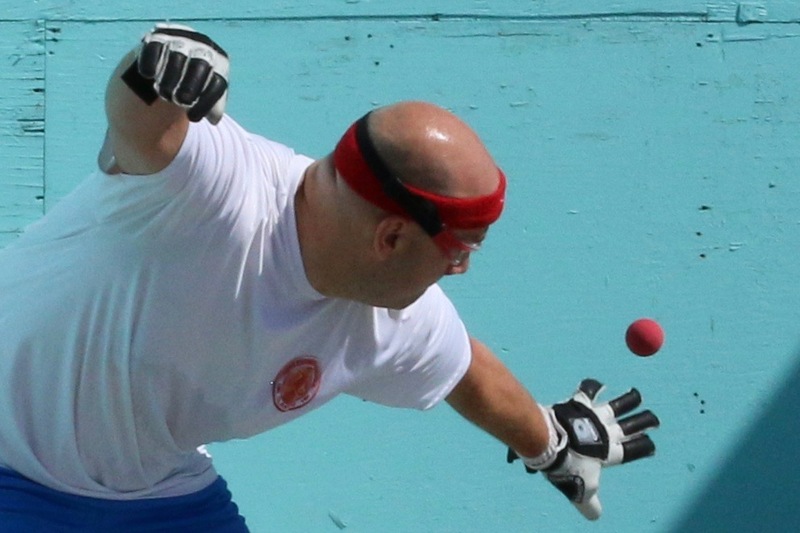 ►To garner championships, a competitor must abandon the “playing” mindset from the outset. Champions don’t play handball or play tournaments. They win championships. Winning requires that anyone intending to become a champion develop a much different approach and process to a sport and to practice. Winning requires conducting more of a military campaign with one’s existing resources, against a similarly minded opponent who has a different set of physical and psychological resources. ►From the outset, David faced opponents with superior footspeed, as he self-admitted; he also faced many opponents with superior physical strength. So he learned very early on that winning championships required applied defense. Analysts have observed that David Chapman had a defensive style, and he approached matches with a defensive mind-set. What does that actually mean? In martial arts and in the military arts, when facing a tougher-stronger-faster opponent, the smaller, slower, weaker defender must use the opponent’s strength and speed and size against him. Attacking, or, in other words, pure offense, requires unbalancing oneself. An attacker must move off center to commence an attack. Once an attacker moves off-center, he goes off-balance. So he can now be toppled by his own actions and by his own top-heavy weight and forward momentum. True Defense requires finding the center of the combined joint attacker-defender action. It requires being in that center. It then requires moving the attacker around that center, by using the attacker’s own strength, energy, and movement against him. Fred Chapman knew this principle, and so did Lew Morales. They transferred said knowledge to David. While being a fundamental principle mentioned in The Art of War; the centered defense is fundamental to Aikido and to Judo as well. Ed O’Neill might appreciate that. ►David learned that he needed a two-way one-hundred percent shot, to execute for points, and, based on the principle of defensive inertia discussed above, using and leveraging the opponent’s power, he picked the best opportunity in handball to execute for points: the backwall setup. During a handball match, a strong opponent’s power, speed, and momentum create many many backwall opportunities. David simply merged his weight with these to lay the ball down and score. David also used the opponent’s own power and momentum to defend their serves and kill opportunities: so he learned how to block or finesse opponents’ serves and kill shots for ceiling returns and/or for re-kills, “dumps,” and re-passes. To accomplish all of these defensive skills, he knew he needed to center himself in the court. So he always made to move back to the red-carpet area. As a matter of fact, the next time you compete, if you visualize and listen very closely, you will see he’s there, right now. Editor’s Note: Just before Chapman passed, October 10th, 2017, he sat down with Boak Ferris and wrote an amazing story about anticipation. This story was published only on this website and was featured for multiple weeks beginning with its original publication date of August 22nd, 2017 (almost 45 days before Chapman passed).